My $8 soybean stew with side dishes. Don’t you just love food prepared by women who know their way around a kitchen? Our moms, grandmas and great grandmas who cooked 365 days a year – each day was practice in chopping, flavors, techniques and taste testing. 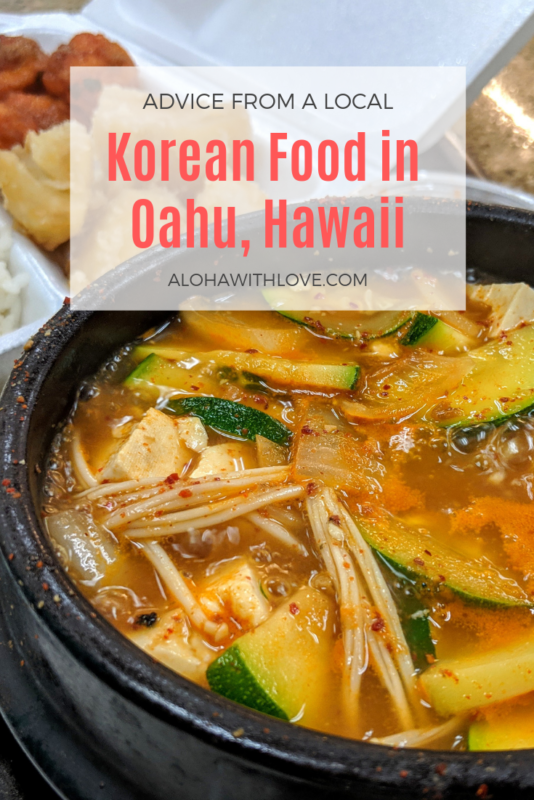 If you’re into Korean food (or delicious food in general), you’ll be surprised to learn that one of my favorites spots for good Korean food is not a restaurant. Instead, it’s a tiny food court in a small Korean grocery store in Honolulu. Why? Because they hire Korean ajummas to do their cooking. The area across Ala Moana Center on the other side of Kapiolani boulevard is locally and unofficially called Korea Town (according to my local Korean friends). A quick drive through the streets reveal a smattering of Korean shops, eateries and signs. Look for Palama Super Market, a small beige building with blue letters in English and Korean. Come hungry and save some room for snacks! For those of you who don’t watch Korean dramas like my Dad (he loves them), an ajumma is an older female, usually married or at a marriageable age. Loosely translated, it means “aunt,” but I’ve always understood it to represent a stereotypical, older housewife. It’s a small food court. There are 3 or 4 other small shops selling food, drinks and snacks, but without question this one is always the busiest. 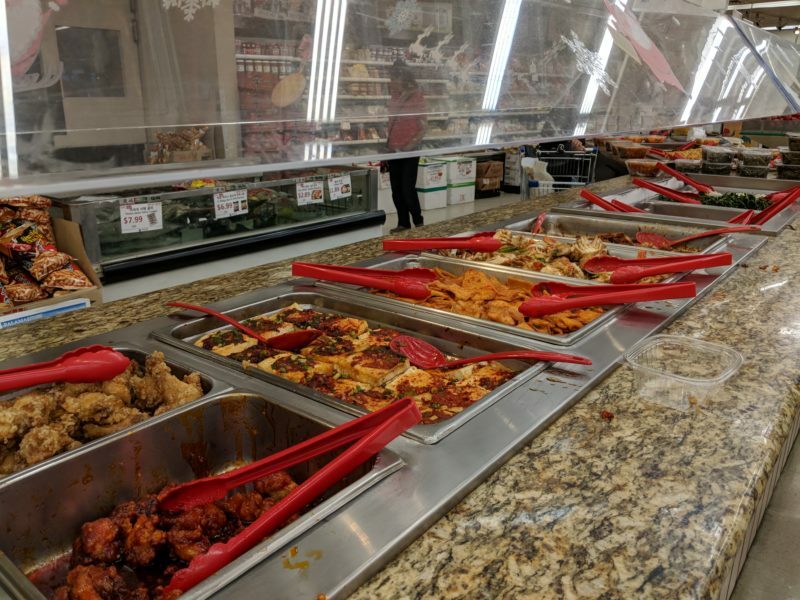 There are 2 other Palama super markets (one in Waimalu and another in Kalihi), but most people prefer the food in Honolulu. Maybe because it’s in Korea Town? The food is affordable. Most meals cost between $7 and $12 and include side dishes. There’s free water, too. Parking can sometimes be a hassle, but there’s a 2nd parking lot above the building. Just drive into the 1st floor lot and follow the road to the end of the building and up a ramp. Everything is good! The chicken katsu, meaty plate lunches, all the stews, bibimbap and even the cold noodle soup are great. The Palama super market main menu. The food court is just a small part of Palama Super Market (but totally worth it). The rest of the market is a grocery store full of fresh fruits, vegetables and meat. But it’s the homemade side dishes that steal the show. 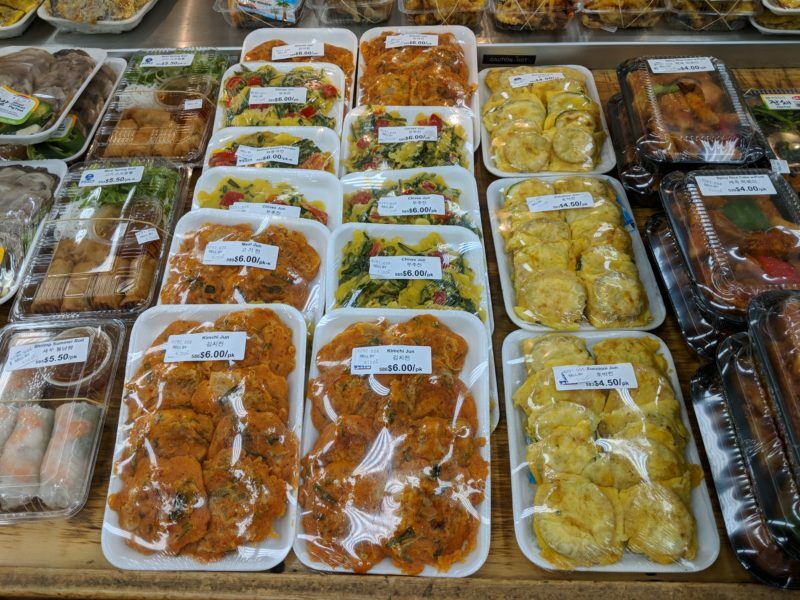 Everything is laid out in self-serve style and it’s a great way to add variety to your meal. Try some marinated crabs or sweet taegu if you’re not sure what to try. There are also a lot of side dish snacks wrapped up and ready for you to take back and eat later. Sweet potato, kimchi jun, bento boxes and even spring and summer rolls. Local Tip: There are a lot of Koreans who shop here. Ask any of them for their recommendation if you really want to have an authentic taste of these side dishes. Most of the workers are also Korean and can offer you suggestions as well. Even more side dishes in the grocery side of Palama super market. Saranwrapped side dishes and bentos (boxed lunches) are yummy. There are a ton of other Korean restaurants that are both delicious and affordable, but I’ve always loved the simplicity of Palama’s menu. Plus, I love that Korean ajummas are in charge of the cooking. Who better to cook delicious Korean food? 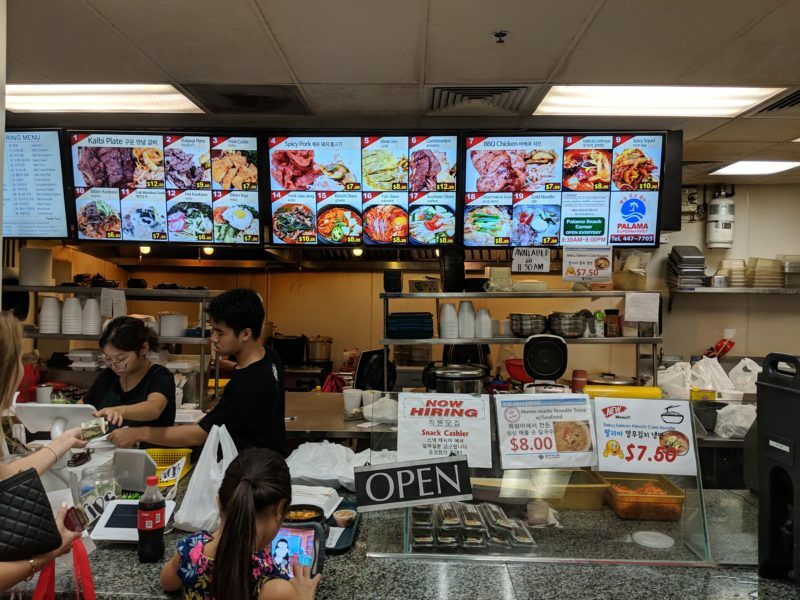 If you enjoyed this post on Palama Super Market’s food court and plan to visit Hawaii someday, sign up below to get my local Hawaii tips. It’s free and I can’t wait to help you plan the perfect Hawaii vacation.